Unfolding from pure potential (Implicate Order) into physical being (Explicate Order) creates a new set of rules and apparent realities for us. We are seemingly no longer “one,” we seem to be individuals, disconnected from each other, with distict and separate identities. The ancient Greeks were the first civilization to confront this apparent schism. 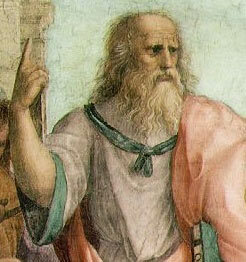 Plato, in his dialogue Phaedo, first articulated his Theory of Forms, wherein he suggests that there exists an abstract reality beyond the world of the senses. Aristole and other Greek philosophers refined this idea, but what essentially emerged was a description of reality in dual terms: up/down, light/dark, black/white, and the like, an idea that still guides us today.